Wat Traimit Witthayaram or the Temple of the Golden Buddha stands at the junction of Traimit, Yaowarat and Charoen Krung Roads. Just across from the main entrance of Wat Traimit is the Odeon circle and the archway to Chinatown Bangkok. 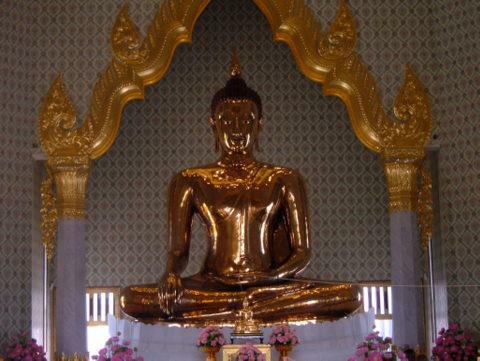 The Golden Buddha is 3.98 m high and 3.13 m wide from knee to knee. It’s cast in solid gold weighing 5 tons! The statue has a very unusual history. When Bangkok when established as the new capital, the Chakri Kings encouraged the recovery of Buddha statues abandoned in Ayutthaya and the northern cities. These statues were transported to Bangkok by the Chao Phraya River. In the reign of King Rama III (1825 – 1851), a huge statue of Buddha apparently made of brown clay was installed in Wat Phraya Krai in Charoen Krung Road, Yannawa district near the Taksin Bridge. In 1931, the temple was somehow abandoned and remained deserted until 1957 when the East Asiatic Company took over the premises. On 25 May 1955, when the old temple had to be vacated, one of the two Buddha statues there was to be installed in Wat Traimit. By a strange quirk of fortune, as the statue was hoisted up, it slipped from the straps and fell to the ground. The horror of the onlookers turned to surprise when they examined the statue. The plastic lacquer shattered on impact revealing a Buddha statue cast in solid gold. A closer examination revealed that the statue dated back to the Sukhotai period in the 12th to 13th centuries. The statue was coated with lacquer to discourage the Burmese from looting it. The ploy worked. The Golden Buddha was dissembled to remove the plastic lacquer and reassembled. 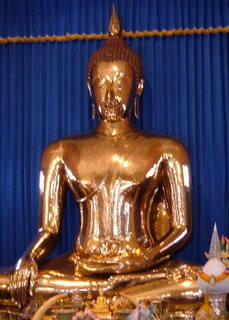 Since then, the Golden Buddha has been placed in Wat Traimit, Yaowarat, Chinatown Bangkok. Today hundreds of devotees visit the temple daily to pay homage and pray at the feet of the Golden Buddha. 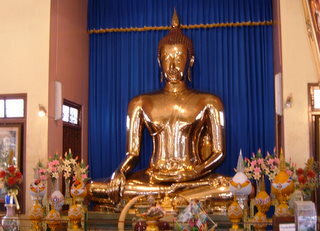 The Golden Buddha is placed in the second story of a separate building in the temple. Shattered pieces of plastic lacquer are on display in a glass showcase to the left of the Golden Buddha. Access to the temple can be from the gate in Traimit Road or from the main entrance in Charoen Krung Road. On 14 February 2010, the new building housing this sacred Buddha statue was open to the public. The Golden Buddha is installed at the highest level in this impressive building which has become a landmark in Yaowarat Chinatown. On the second level of this building there is a museum on the history of the Golden Buddha and the method of casting golden Buddha statues. The old pulley and ropes used for hoisting the Golden Buddha on that fateful day on 25 May 1955 are preserved in a case here. So are the lacquer fragments that broke off when the statue fell to the ground. Another interesting historical snippet in this museum can be found in a copy of the 1991 Guinness Book of Records which lists the Golden Buddha as the “sacred object with the highest intrinsic value of £21.1 million. This valuation is based on the gold price in April 1990 at £227 per fine ounce. 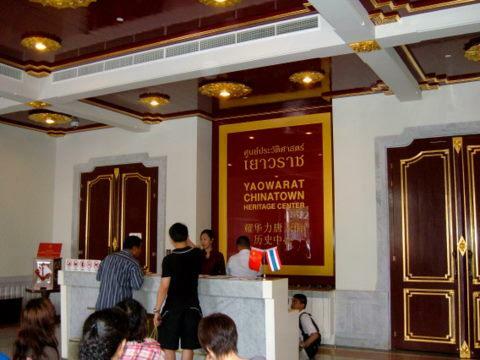 The Yaowarat Chinatown Heritage Centre is on the first level. 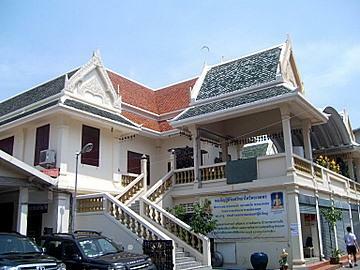 This museum preserves the history of the Chinese immigrants in Bangkok and Thailand. This heritage centre replaces the Samphanthawong Museum which used to be in the temple grounds. However the building housing the Samphanthawong Museum was demolished in 2006 to make way for this new structure. The Samphanthawong Museum, I understand, has moved to the Pathum Khong Kha School opposite Wat Pathum Khong Kha which is along Walking Street Chinatown. The two museums are open every day except Mondays from 0900 – 1700 hours. 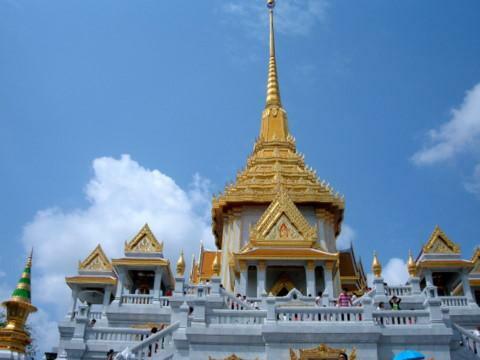 The easiest way to get there is to take the subway to the Hua Lamphong station and then walk to the temple of the Golden Buddha. 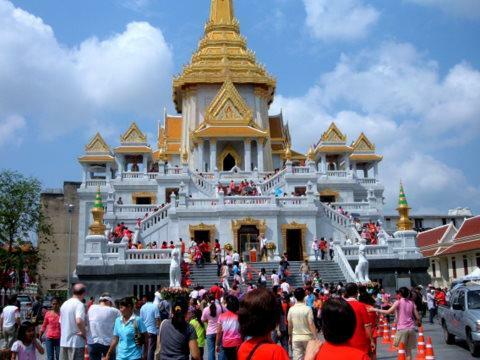 Wat Traimit, the temple of the Golden Buddha, is a Bangkok legacy at the gateway to Chinatown Bangkok and for more Bangkok Temples.